I came home this afternoon thinking I was going to clean my craft room after yesterday's creating session, instead I started playing around with different Sweet Stamp Shop sets and decided to squeak in with my last entry for the Sweet Stamp Shop March Challenge. When I recently ordered the Timeless Twine Sweet Sampler pack from Bella Creationz, I also ordered some small brown paper bags. I knew they would come in handy and thought they'd be ideal for some Easter treats. I stamped the sentiment and the images in Memento Rich Cocoa. The bunny, tulips and sentiment are from the Sweet Spring set. The log is from the Furry Friends Forever set. The twine is from Timeless Twine and the grass die is from My Favourite Things. I coloured the bunny pink and used some liquid applique on his ears and tummy. The doilie is from GinaK Designs and I treated it with different distress inks (I actually made it for a different project but ended up not using it at the time). 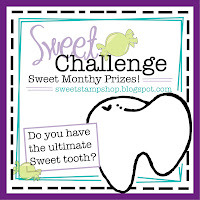 Thanks for popping in and do hop over to the Sweet Stamp shop and check out all the other entries!